A traditional Spanish bungalow on the exclusive resort of La Sella Golf and Tennis. The apartment has views towards the mountains on one side, and the sea in the distance, and is surrounded by Bougainvillea and other scented flowers. There is a beautiful communal swimming pool surrounded by tropical gardens. The apartment is within easy reach of the Blue Flag beaches at Denia and Javea. Same guest have returned each year. We have owned this apartment since 2002 and have had many guest stay over the years and have all expressed what a great time they have had. We have modernised the apartment with new kitchen, lounge area and beds to make it more comfortable for us and guest. We have replaced pillows, towels and all crockery, cutlery, utensils and new table and chairs and outside patio furniture in 2018. Very Spanish amid beautiful orange and lemon groves. Fantastic quiet beaches very close by and tourist beaches at Javea with many restaurants on the sea front if you want it busier. Denia is a typical sea front Spanish town, with restaurants and boutique shops and a marina. You can take a ferry to Ibiza, Formentera and Majorca from here. 30 minutes south you have Benidorm, loads to do and need I say more. 60 minutes north you have Valencia with again lots to see and well worth a visit. The pool at the apartment is beautiful around trees and is very quiet and big enough for all. There are also 2 other pools that you can use, one is huge with waterfalls that has a lifeguard in the summer months. Main feature is the swimming pool, quiet relaxing and very warm. It is only a 5 minute walk to the shop and tennis centre, so no car needed to get shopping or a meal at the restaurant. Take away and Pizzeria for those Pizza's by the pool in the evening. Internet cafe and pharmacy. There is also an office where you can by tickets for popular tourist attractions. Bathroom with shower and bath and new toilet. Only one set per stay, if you want additional sheets etc can be supplied for 25 euros. One set, extras can be provided for 2 weeks stays from our cleaner at an additional small cost. Living room with sofa bed, living area seating for 4 people. Dining area with seating for 4 people. New satellite TV where you can now get all the popular UK channels. Freezer compartment in fridge too. Fully fitted modern kitchen with oven, hob and extractor. All home comforts and washing machine. Toaster, kettle, microwave etc. Balcony terrace with new table and chairs with new cushions. Terrace outside front door where people cook BBQ’s etc. Just down the road at the tennis club. 3 Golf courses within a 15km radius. Beautiful pool areas Quiet and peaceful. Notes on accommodation: Entertainment: audio tape player, CD, radio, satellite TV,, stereo system. There are fan heaters for winter use. Bedroom and lounge have new ceiling fans installed to keep cool in summer. Long term renters welcome. Pets not allowed. Outside: Balcony, parking, communal swimming pool, terrace, 4 garden chairs, 2 beach chairs. Utility Room: Washing Machine in Kitchen Cleaning / Towels / Linen / Maid service is not available. Linen is supplied and changed weekly on request, please bring your own beach towels. We supply 2 beach towels. Other: Balcony overlooking sea in distance and mountain. Large terrace at entance of property. The front terrace has sun in the morning and the back terrace is sunny in the afternoon for part of the day or just sit by the pool all day and top up the tan. Hemos disfrutado mucho de la estancia. Repetiremos. Thank you Luis, I am pleased you enjoyed your stay. Thank you for your review and your message when you were on holiday saying you were enjoying the apartment and the area. We hope you return one day. Todo muy bien,excelente , tranquilo, perfecto para desconectar, sólo que hay que coger el coche para todo y no hay sitios adaptados para mascotas. Hi, Thank you for your positive review Natalia. I am pleased you enjoyed your stay and would welcome you back anytime. Walking and mountains to explore. Denia is 8km approximately - 10 minutes. Alicante airport is a 1 hour drive. Valencia airport 1 hour drive. Murcia airport is 2 hours. The owners want to make your holiday as enjoyable as possible, and have thought of everything. A modern kichen with fridge, washing machine, microwave. Also there is a stereo, Portable TV with satellite and a new 2 piece suite with sofa bed in the lounge. Patio furniture is provided. Our aim is to have you return year after year, providing value for money, and most of all a fantastic holiday. 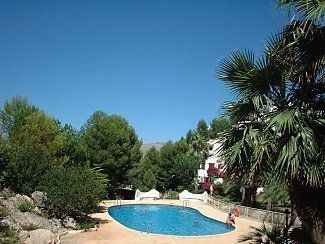 La Sella is about 8km from the main town of Denia. Further afield there are the towns of Javea, Olivia, Moriara. Within 30 minutes drive you have the theme park Terra Mittica and Benidorm. Local Activities include cycling, fishing, golf, horse-riding, mountain biking, sailing, swimming, tennis, walking, waterskiing and windsurfing. Booking Notes: £50 deposit payable at time of booking and balance payable 6 weeks prior to departure. A £50 security returnable deposit required. The security deposit will be refunded once it has been inspected. Dogs welcome. Changeover Day: Flexible. Arrival and departure time flexible depending on change over times. Notes on prices: Prices are for the property per week in UK Pounds. Longer lets available. Water and electricity all included. Special Offers: Please phone.